We have done so well with the weather this year, with the best Summer I can remember and now even in October, when I fully expected to be back to wearing my boots and winter coat, the temperatures are still in the late teens. This unexpected weather has meant that I can enjoy wearing sandals for a bit longer so when Simply Be offered to send* me an outfit to style around a pair of their sandals, I couldn’t wait to get a new pair! Now, the sandals that I completely fell in love with are not anything like I have bought since I have had Lucas. These sandals grabbed my attention straight away as they are exactly the type I would have gone for in my single, pre Lucas days, when I didn’t have many responsibilities and I shopped regularly for new clothes and ridiculously high heels. 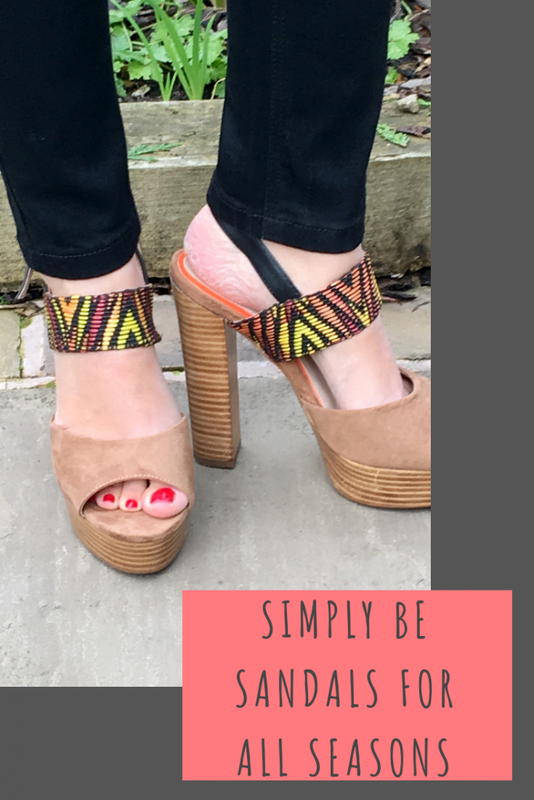 I love, love, love them, they are tan and have a woven print in shades of yellow and oranges along the strap and a black buckle fastening, the colours are perfect for both the autumn and summer seasons. They are also a lot more comfortable and easier to walk in than they look, due to the platform at the front of the shoe. 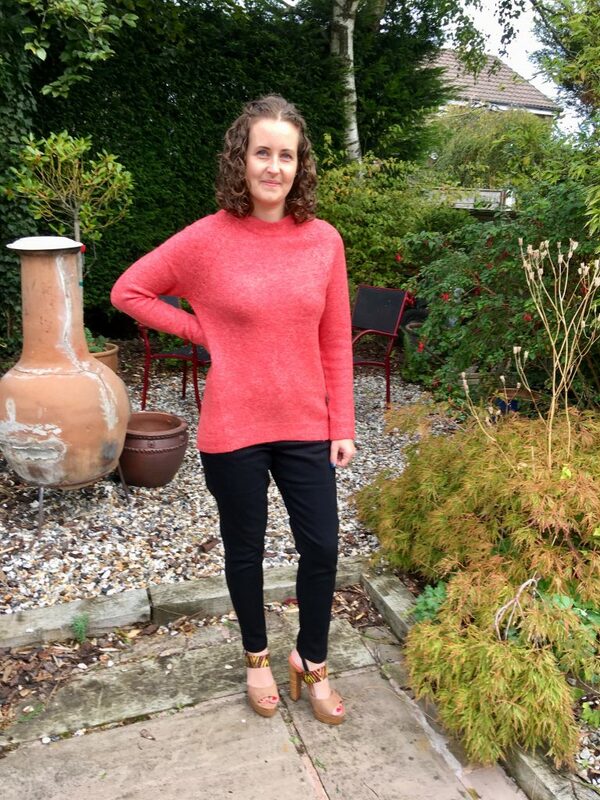 I chose a Monsoon jumper in rust which co-ordinates perfectly with the orange tones in the sandals. It is beautifully soft and has been spun with wool for extra warmth, which will be needed through Winter when the temperatures do drop. It features lovely detailing too from open stitches and chevron rib on the neck, cuffs and hem. I completed the outfit with black skinny jeans that are a comfortable stretch denim with an elasticated waistband. I love skinny jeans, they are great whether you are wearing boots, wellies, sandals, flats or heels. 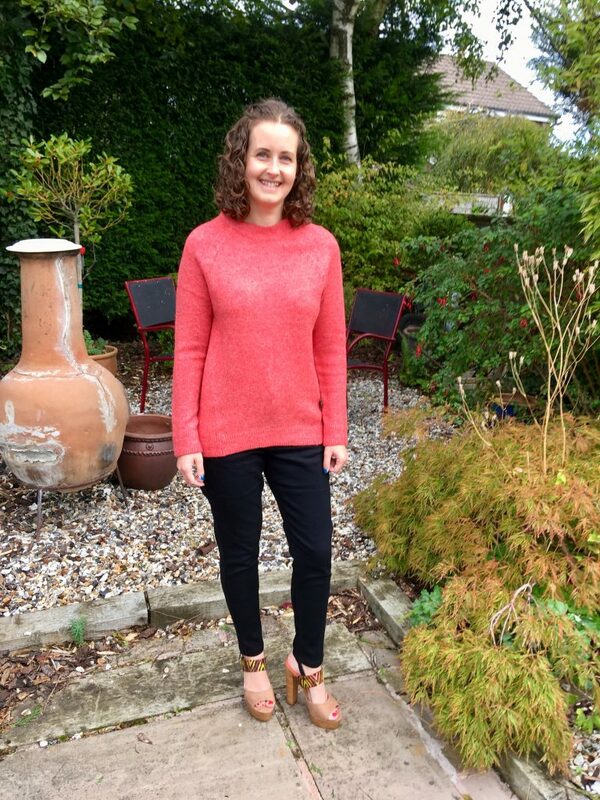 I am really pleased with the outfit, the jumper will no doubt be out on various occasions as it is so easy to dress up if I am going out or dress down to wear on a normal day. The sandals will be making their first appearance for a girls night out meal and my Mum has also said she’s borrowing them for her Christmas do! Those are really snazzy sandals! I had no idea Simply Be did such glamorous items! Oh wow these are beautiful! I can only dream of being able to walk in heels like this though lol! I love the bit of colour on the top strap it really makes them extra pretty! I love those shoes, and that outfit it perfect for a mild fall day.